When Billy Morgan became the first British man to win a Winter Olympic medal on snow, little did he know what opportunities would arise from it. But 14 months on from his bronze medal in the snowboard big air at the 2018 Games in Pyeongchang his podium success has led him to a modelling contract, VIP guest appearances including a trip to the football World Cup in Russia - and even working as a stunt man! The 30-year-old has just returned from filming a British television series in Romania. "I am not allowed to tell you all the details but I can reveal it's not the new James Bond film," he told BBC Sport. "But I was a stunt double in a snow scene where I was being chased by people on snow mobiles. It was great fun but how random is that, that I got to do it?" 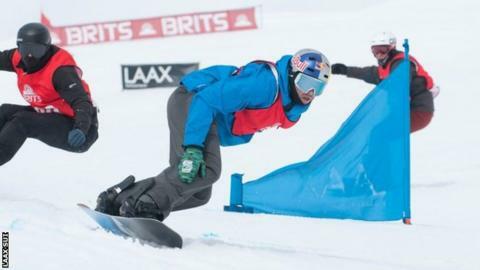 After his medal triumph Morgan decided to take the season off from competitive snowboarding and has yet to confirm whether he will commit to the 2022 Olympics in Beijing. He has been riding for fun this season and even decided to try his hand at snowboardcross at the British Championships, which are being held this week in Laax, Switzerland, and which he won. "I'm not used to racing against others. There was a bit of pushing and shoving but I somehow managed to make it out alive and across the finish line. I enjoyed it but I won't be switching to boardercross," he said. Beijing would be his third Winter Games and he has until the 18-month qualifying period opens in August 2021 to make a final decision. "I'm still not 100% sure," he said. "I'm leaning towards not at the moment. I watched an event recently and thought I'd really get Fomo (fear of missing out) but I didn't and that's a little sign for me." Morgan, who only started snowboarding at the age of 14 at a dry slope in Southampton, burst onto the scene when he entered the Brits in 2010 - and won the big air. "I had been working the ski season in Morzine in France and a few friends were going to the Brits and there was a space in the car so I went along," he recalled. Having competed in acrobatics to a high level as a child, learning snowboard tricks came easy with his natural aerial awareness. "No-one knew who I was but I rocked up and won the Brits with a double backflip," he said. That performance led to him being invited onto the British team at a time when freestyle was being embraced by the International Olympic Committee, who added slopestyle to the 2014 Winter Olympics programme and big air in 2018. Morgan, who is responsible for two world firsts - a quad cork 1800 and a triple frontside rodeo 1440, said: "I never aimed for the Olympics. I liked snowboarding and doing tricks. Being on the British team and competing meant I could make a career out of it." "It was perfect timing I was around when slopestyle and then big air were brought into the Olympics." So how often has he watched his medal winning moment? "I only watched it back for the first time a couple of months ago because I'm in the process of writing my autobiography," Morgan said. "Looking back, I was quite lucky to win the medal. The other riders pushed too hard whereas Hamish [McKnight, head coach] and me played it tactically with the tricks I did - and luckily for me, it paid off."